How much did couples spend on their wedding in 2014 ?
. . . Here are the results of the 2015 Annual Irish Wedding Survey from www.Mrs2Be.ie which is Irelands most respected Online Wedding Forum. 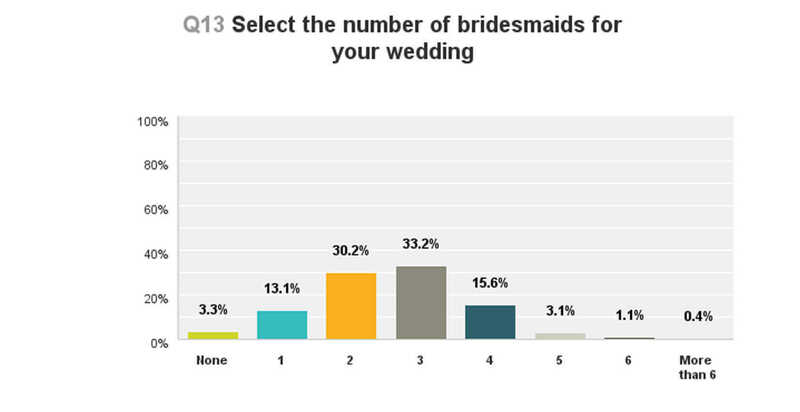 They surveyed 2,407 Irish Brides & Grooms, which makes this the largest Wedding Survey carried out in Ireland. Ever ! 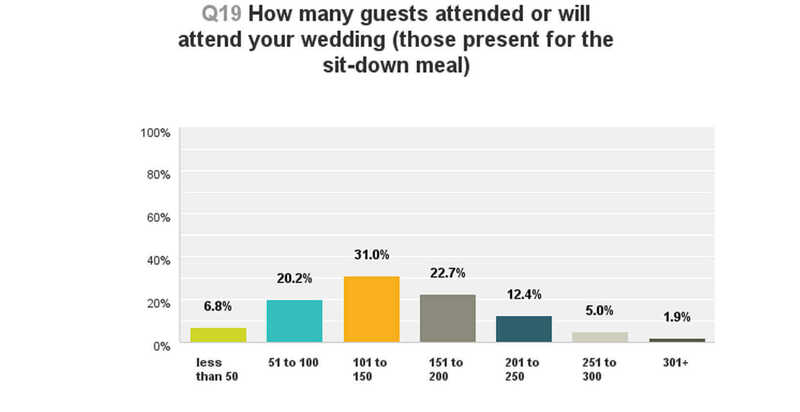 As part of the research for the annual Irish wedding survey, they always ask the recently married couples what they spent on the various aspects of their wedding. Some brides will obviously spend less and some will spend more but this is just the average for what it costs Irish couples to get married. Average spend by couples on their wedding in 2014 was €19,635. BIGGEST REGRETS OF THEIR WEDDING ? "Should have booked a Professional Videographer to capture the day – because it goes by so fast"
"Should have allocated more budget to the photographer"
"Should have given a bit more time to the wedding photos on the day"
"Should have started getting organised for the wedding earlier"
"Shouldn’t have bothered with wedding speeches"
"Should have spent more time on the dance floor"
"Should have worn a different wedding dress"
"Shouldn’t have been as nervous & stressed in the lead up to the wedding"
WEDDING TRENDS IN IRELAND ? 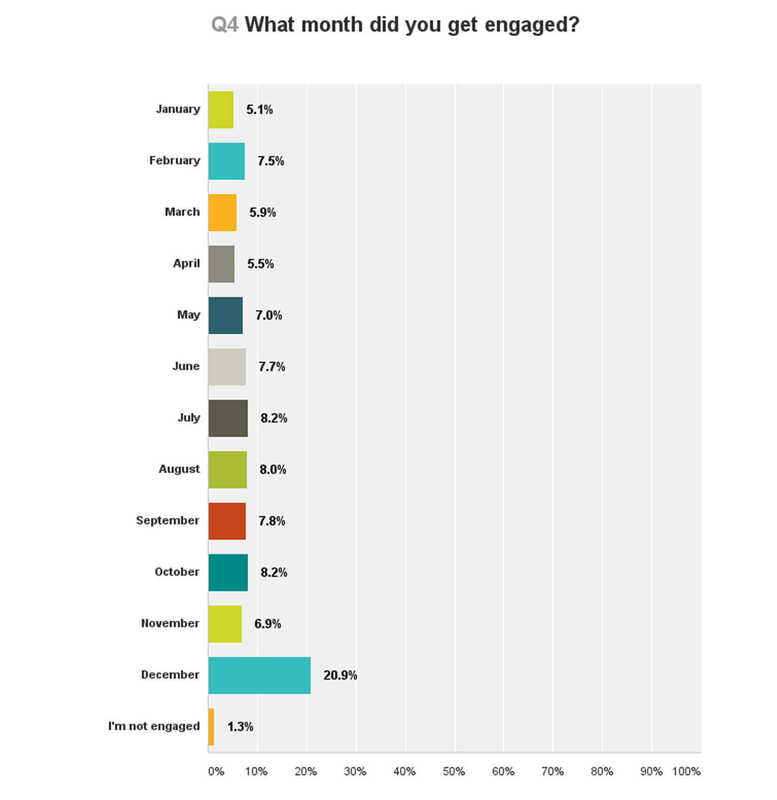 December is by far the most popular month to get engaged (1/5th of all engagements). January is the least popular month, to pop the question. The trend for shorter engagements is continuing. 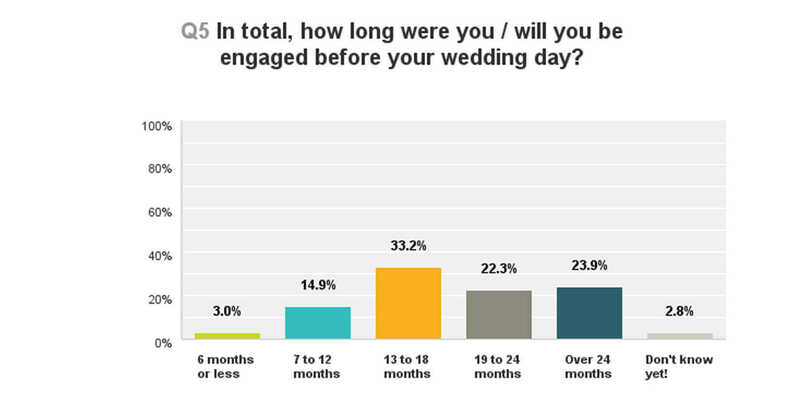 Two years ago, the survey revealed that the majority of couples were to be engaged for two years or longer. This year and last, the majority fall into; 13 to 18 months. More than 1 in 4 couples now live together for more than 5 years before getting married. 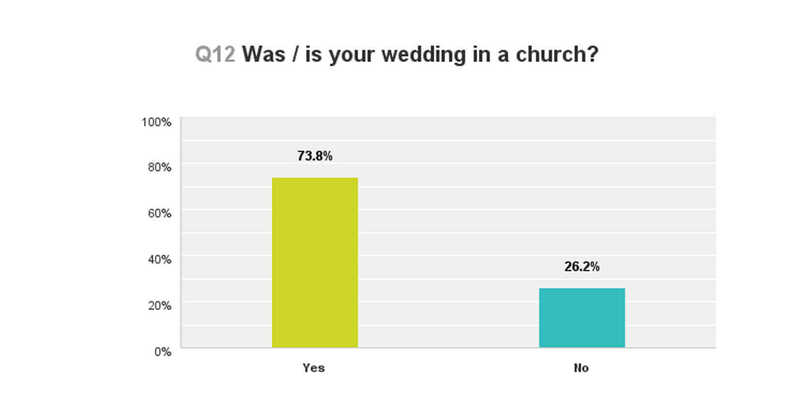 Almost 1 in 4 couples who completed the survey DO NOT get married in church. The most preferred number of bridesmaids is Three. 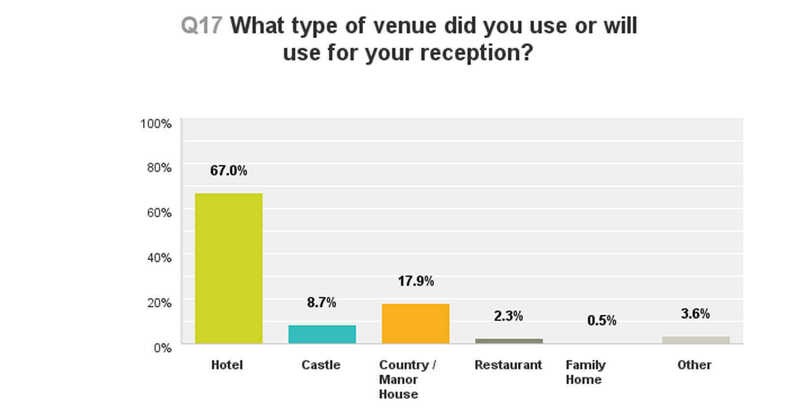 Country manors / exclusive venues are growing in popularity with 18% of couples opting to host their weddings there. 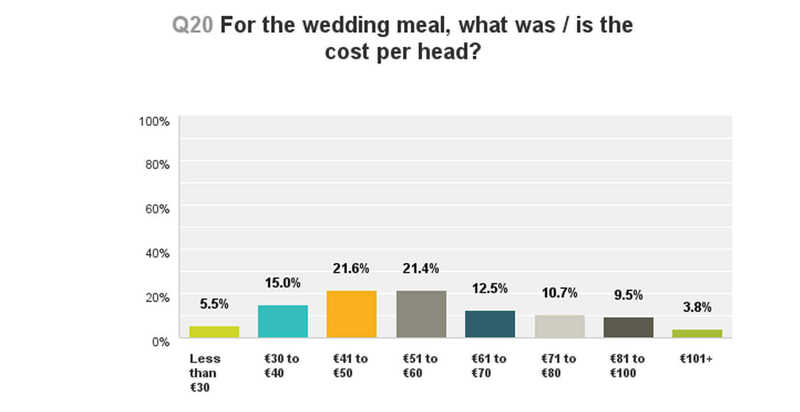 Approximate spend per head on the wedding meal falls between €41 & €60. 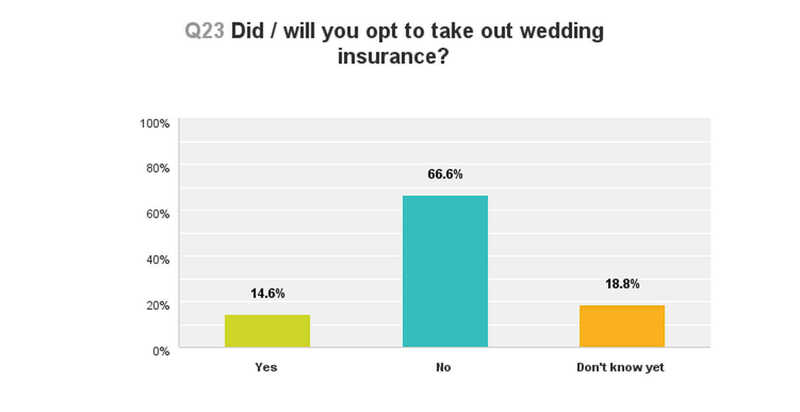 Almost 1 in 7 couples are thinking about taking out wedding insurance. This has dropped slightly since last year which may be an indicator of increased consumer confidence. Good news for nervous public speakers, having the wedding speeches before the meal is becoming increasingly popular. 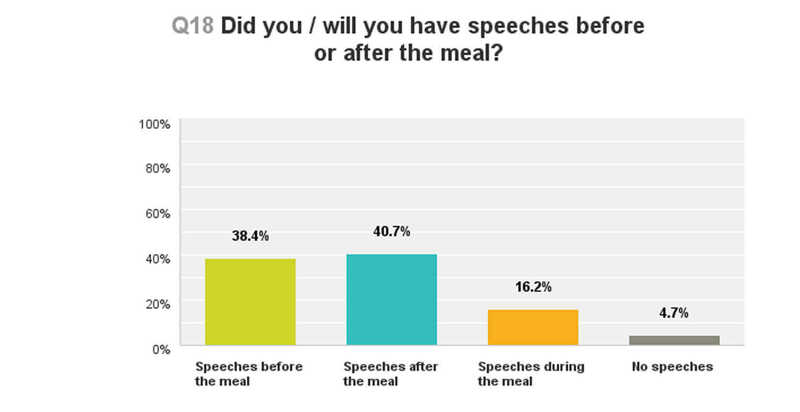 The preference for having speeches after the meal still takes the lead, but only just. We wouldn’t be surprised to see speeches beforehand taking the lead next year. It’s becoming increasingly popular for couples to opt for wedding insurance just in case anything goes wrong. 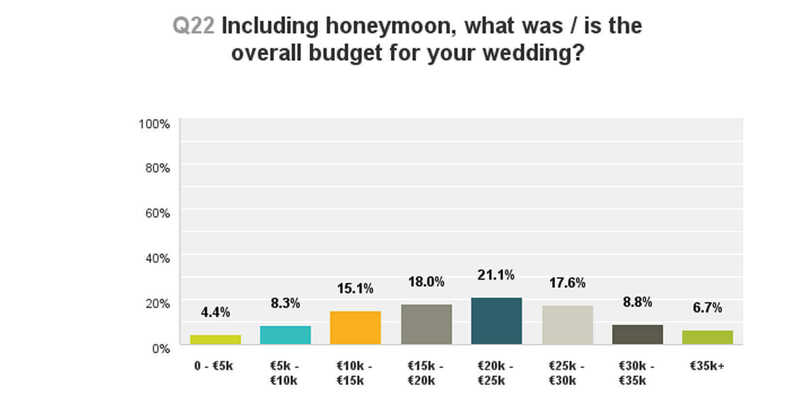 The average spend on Irish weddings is within the €20k to €25k bracket. Traditionally, wedding speeches were usually always after the meal. Country houses and manor houses are really growing in popularity in Ireland where they now account for about 1 in 5 weddings. 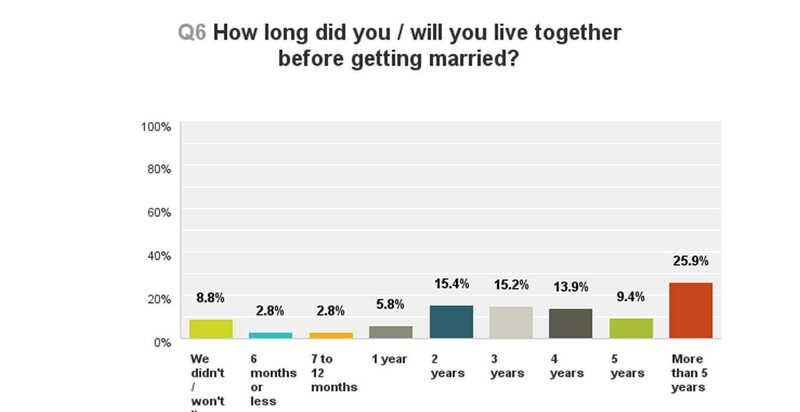 So there you have it, the results of the 2015 Annual Irish Wedding Survey from Mrs2Be.